The mattress industry is one of the oldest continuous industries in the world. The first mattresses are believed to have been manufactured around the 37th century BC in Persia. Those first mattresses were made of goatskins that were filled with water. Over the next 2,000 years, not much would change for the mattress industry. By 1871, the innerspring mattress had been invented. Since then, numerous innovations have occurred. Foam cores are available for some models. Air beds, waterbeds, and adjustable sleep sets are available. Materials even include latex, polyester, and recycled materials with the industry’s new designs. Since the beginning of modern humanity, people have wanted to sleep on something that felt comfortable. Although mattresses have evolved dramatically over the years, the industry has continued to thrive. As long as humans require sleep, they will want to own a mattress. That means there will always be a place for the mattress industry. New innovations within the industry will continue to shape it and place pressure on the traditional innerspring market. An example of this is Purple, which creates a unique bed that stands in a design category of its own. It retails for around $1,000. Mattresses shipped in boxes will continue to be a trend that people enjoy as well. There is no longer a need to try a mattress before buying it. 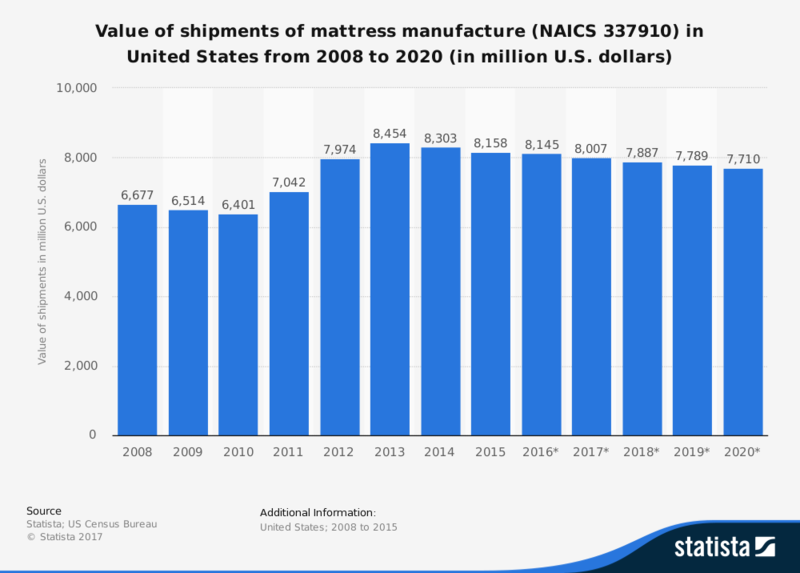 There may continue to be shifts in who has the greatest influence in the mattress industry, but the industry itself will continue to exhibit strong levels of growth. With a renewed focus on the quantity and quality of sleep people receive, the mattress industry will keep booming.